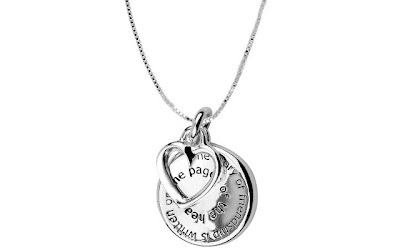 This Sterling Silver "The Story of Friendship Is Written On the Pages Of The Heart. I am a Better Me Because Of You" Pendant Necklace, 18" is currently selling for just $25.00 on Amazon.com! You will be saving 38% off the listed price of $40.00 with this jewelry deal. What I like about this necklace is the heartfelt sentiment engraved on the pendant. Although the quote is about friendship, this necklace would make the perfect gift for a husband, boyfriend, or fiance to give to his better half who also happens to be his best friend. Take a look at more friendship quote necklaces I had previously shared.